What is an electrophysiology study and catheter ablation? An electrophysiology study is a procedure used to study the flow of electricity in the heart with the purpose of identifying the exact cause of irregular heart rhythms called cardiac arryhtmias. 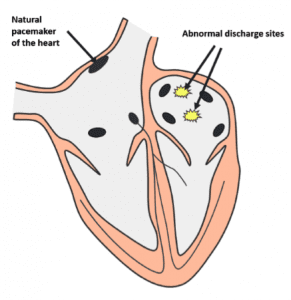 Once the abnormal areas in the heart from which the arrhythmias originate are found, radiocatheter ablation is used to destroy them by applying a high frequency electrical impulse via a special catheter (ablation catheter) that generates intense localised heat destroying all the cells in that area. This allows definitive treatment of certain arrhythmias without the need for further medical treatment. In human medicine, these procedures are widely available despite requiring highly specialised skills. In veterinary medicine, they are only available in a few select centres across the world. We are very proud to be one of these centres. Under general anaesthesia, catheters are introduced via the veins in the neck and leg all the way to the heart. These catheters are positioned in key areas inside the heart with the help of real-time x-rays (fluoroscopy) and cardiac ultrasound (transoesophageal echocardiography). They have small electrodes that record electrical impulses from the heart muscle – intracardiac electrocardiograms. Electrical impulses are also delivered to the heart muscle via these catheters in specific ways that can trigger or terminate the abnormal heart rhythms so that their origin can be located. During the study, a series of tests are also performed to assess the function of the normal electrical pathways and structures in the heart. These procedures are very safe with a low complication rate. Possible complications include the risk of bleeding, infection and damage to cardiac structures during ablation. Depending on the underlying cardiac arrhythmia, there may be a potential for a life-threatening rhythm disturbance called ventricular fibrillation to develop. This is particularly true when arrhythmias arising from the lower chambers of the heart (ventricular arrhythmias) are present. These are not normally addressed in our patients. However, in the unlikely event that this should happen, we have a defibrillator present and ready to use in all cases. 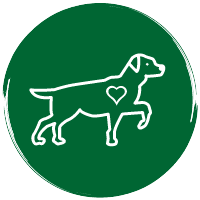 All cases are managed by a veterinary anaesthesia specialist assisted by a dedicated veterinary nurse and with a full anaesthesia monitoring suite, a wide range of anti-arrhythmic drugs, and defibrillator and artificial pacing facilities. In most cases 2 – 3 hours are sufficient, but in some complex cases it may take up to 6 hours. Since these procedures are minimally invasive and curative, most patients are discharged on the following day with just a small surgical wound in the neck and femoral areas. These areas are protected with a bandage or a plaster until healing is complete in 8 – 10 days. If the procedure is successful, anti-arrhythmic treatment is stopped immediately. Which cardiac arrhythmias can be treated in this way? In human medicine these studies are routinely used for the diagnosis and treatment of many arrhythmias arising from all areas of the heart. These include rhythm disturbances from the upper chambers of the heart called supraventricular arrhythmias, such as accessory pathway mediated tachycardia (e.g. Wolff-Parkinson-White Syndrome), atrial flutter, atrial fibrillation, focal atrial tachycardia; and ventricular arrhythmias that arise from the lower chambers of the heart. This disturbance is caused by the presence of one or more abnormal extra electrical connections or pathways between the upper chambers of the heart – the atria – and the lower chambers of the heart – the ventricles. Normally, there should be only one electrical connection between the atria and ventricles – the atrioventricular node. The presence of extra connections – accessory pathways – allows the electrical impulses to travel in a loop between the atria and ventricles causing a “short-circuit” and inappropriately high heart rates. During the electrophysiology study the location of these pathways is identified and subsequently destroyed with radiocatheter ablation. Success rate: 90-100% with a 5% chance of recurrence. This means that, in most cases, the pathway appears to have been completely destroyed during the procedure, but in up to 5% of cases it may subsequently heal and regain function. This is not possible to predict before or during the procedure. The red arrows show the direction of the electricity flow during the “short-circuit”. 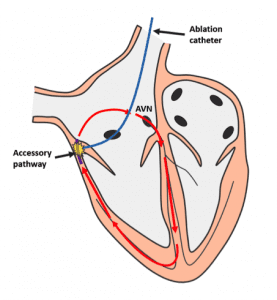 The electrical impulses flow from the upper to the lower chambers of the heart through the atrioventricular node (AVN) and then back up via the accessory pathway. The ablation catheter is seen with the tip positioned over the pathway. This disturbance is caused by the presence of one or more areas of heart muscle that have developed the ability to spontaneously generate electrical impulses and compete with the natural pacemaker of the heart – the sinus node. This is normally a consequence of damage to heart muscle and can lead to inappropriately high heart rates. During the electrophysiology study the location of these areas is identified and subsequently destroyed with radiocatheter ablation. Success rate: 70-100% with a 7% chance of recurrence (data from humans). This means that in up to 30% of cases the procedure may not be possible, and that in cases that appear to have been successfully treated during the procedure, recurrence may occur in up to 7% of them. This is not possible to predict before or during the procedure. This disturbance is caused by the presence of a “short-circuit” in the upper chambers of the heart that leads to inappropriately high heart rates. It normally occurs in cases with structural heart disease in which the heart muscle has suffered damage. The red arrows show the direction of the electricity flow during the “short-circuit”. 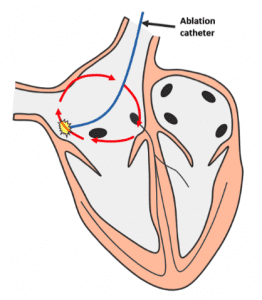 The ablation catheter is seen with the tip positioned to destroy part of the path used for the “short-circuit”. During the electrophysiology study, the path of the “short-circuit” is located and radiocatheter ablation is used to destroy part of it to avoid the electricity flow. Success rate: 90-100% with a 14% chance of recurrence. This means that in most cases the procedure is successful but there is a 14% chance of recurrence. This is not possible to predict before or during the procedure.